“Prince Charming” was not been an album I have been clamoring to hear, to put it mildly. I was resistant to the much-ballyhooed charms of Adam + the Ants in the wacky days of 1980-81 and New Wave. I had read about Adam + the Ants in the press, and not always the music press. The band seemed to ride a wave of hype across the UK tabloids to roost at number one that year. As my cynical ears often did, at that tender age, I dismissed them out of hand and moved on with my young life. By early 1981, the wave of low price new wave label samplers was moving like a freight train. Every label had one, at least. CBS records’ foray was the specious in retrospect “Exposed” double album, which had a $2.98 list price to expose the new artists from the CBS roster who were not getting any love at radio. This meant that the genres here ran the gamut from metal [Judas Priest!] to country [Roseanne Cash] with all points in between. It’s hard to believe that there was ever a time when crass junk like Loverboy would have had a hard time getting airplay but there you are. Since this was cheap, I bought it and the only fallout was that I finally heard this Adam + The Ants… and really liked what i heard. “Dog Eat Dog” was a total hit to me and I ran out and bought “Kinds Of The Wild Frontier” and really enjoyed it. It was an idiosyncratic but fun pop record with plenty of hooks and attitude. Nothing major, but certainly fun. In the summer of 1981, the fabbo single “Stand + Deliver” was released and raced to the top of the UK charts while being shrink-wrapped to lucky, late-in-the-game buyers of “Kings Of the Wild Frontier” here in the US. 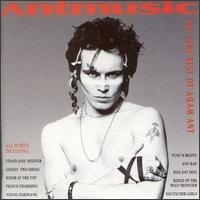 I bought the single as an import 7″ and found it to be the best Adam + The Ants single ever. It was a perfect pairing of A and non-LP B-side; never bettered, really. I was primed for the next album. Until while listening to WUSF-FM and their Friday Night New Wave show in the Fall of 1981, I heard the new UK single from the band. I hated “Prince Charming.” It seemed like all four wheels had fallen off of the previously sleek Adam + the Ants chassis. When the Prince Charming Review tour dragged it’s pantomime carcass through event he sleepy burg I lived in that year, it never occurred to me to go, even though it was a rare New Wave rock show in Central Florida at the tail end of the New Wave trend. I have to admit, that I relented somewhat on hearing the first solo Ant single. “Goody Two Shoes” was a return to the fun sound I knew he was capable of, but I still didn’t bite on any records. I traded in “Kings” during the Great Vinyl Purge and never replaced it with a CD. In 1993, I got the chance to see Adam Ant, now without a label, hype, or much of anything but Marco Pirroni by his side. The “Persuasion” tour of the US that year was a smoking hot show that finally, really convinced me that this guy was legitimate star material. This was a killer set, with a great, cherry-picked list of hits and deep cuts played with gusto and excitement in the intimate club atmosphere. Emboldened, I bought the “Antmusic” greatest hits set that came out that year in the UK. I bought the limited edition 2xCD version with a live disc recorded at the KROQ-FM x-mas show he played at on the tour I saw. It’s a fun live disc and the first disc has a collection of all of the Adam And hits anyone would expect right up to his late period “Manners + Physique” album. By then, I even turned the corner on “Ant Rap,” finding it a fascinating cocktail of wildly differing [undoubtedly McLaren inspired] cultural influences mashed up into a unique hybrid. But I still didn’t buy any Adam + The Ants albums. Until last month. When I was looking at the stock at philadelphiamusic in their Discogs store, I saw “Prince Charming” on CD for $2.00. At that price, you buy it and see what you think! The album started with a fascinating bang when “Scorpios” played back. The horn-laden Latin brass explosion was enough to make Herb Alpert green with envy! The flute was particularly striking to my ears. But the next track, “Picasso Visita El Planeta De Los Simios,” was a hookless, fussy, percussive mess. The still dreadful title cut following it pretty much killed off any enthusiasm that “Scorpios” had engendered. The rest of “side one” was poor. From the cartoony cowboy twang of “Five Guns West” to “That Voodoo,” with Adam’s gruesome vocal harmonies allied with schizophrenic pop that was unconvincing in all of its faces. After a single, practically teflon listening , I made a new record for ditching al album. I traded it in in the same month I had gotten it! There was just no there there, to quote Ms. Stein. The album was “Prince Charmless” to these ears. Better I should get a copy of “Kings” one day, eventually. And maybe the “Friend or Foe” and “Vive Le Rock” albums that all had interesting singles on them. A year or two back, commenter JT played me a cut from the 2013 comeback album [that I had been previously eager to hear] “Adam Ant Is The Blueblack Hussar In Marrying The Gunner’s Daughter” and the trainwreck of a cut killed that desire pretty fast! It sounded like generic 90s alt-rock of the worst stripe! Adam has a career that rivals Duran Duran at their worst for following a triumph with a disaster, but popstars like these know how to keep fans interested with the intermittent conditioning as they dole out albums that run the gamut from successful to wildly inappropriate with mediocrity as the only taboo. This entry was posted in Record Review, Records I Used To Own and tagged 1981, Adam & the Ants. Bookmark the permalink. Having bought this album upon release in 1981, I guess I can’t help but having my current view of it colored by nostalgia. Adam was my first ever pop star crush; God knows what the inhabitants of Binghamton, New York thought of the tall skinny white guy walking around campus and town with a white stripe on his nose and scarves tied around his waist! OK, so the nose stripe was Kings of the Wild Frontier “era”,” but I was still on an Ants groove when Prince Charming came out. Stand and Deliver was the ultra-catchy hook to lure you in, but I found much of the album quite enjoyable. Scorpios is sleazy antmusic for lounge people, Five Guns West a fun spaghetti western interlude, Picasso a kitschy little excuse for whoops and tropical sound effects. I just love all three. I suppose Adam (with or without the Ants) was more of a singles artist, and I certainly can’t argue that Prince Charming is a great album, but for me he was the total package of sound and image. I hate to say this, but maybe you just had to be there. It certainly charmed the 19 year old Taffy, but who can say how it would be received by my 50-something ears if I first heard it today. Taffy – As implied, I was a teenaged curmudgeon who had to be won over by Adam Ant against my will. Fortunately, when he was “on” he was on for me. Knowing what we know now about the guy, I’m sure his bipolar disorder had a huge impact on his art. That show in 1993 was so fantastic, it gave me a lot of interest in what he might do moving forward. 20 Years later I was shocked at how wrong it seemed to me. Believe me, I was really looking forward to buying his last album, until I chanced to hear some of it. I have to admit, I’m on Taffy’s side here. Objectively, Prince Charming is a mediocre record, but having listened to it 1000 times in middle school art class (we only had three LPs to play all semester, over and over*) it’s got a lot of nostalgia value for me, and there need be no other justification for listening to a record: it makes me happy, and who cares if it’s actually a crappy record. I love Scorpios, Picasso, and Mowawk. The B-Side Beat My Guest is a scorcher, and of course Stand and Deliver is a quintessential Ant single. I even like the title track, for what it is. Turns out that Ant paid Harris quite a bit of cash for nicking his riff, but IMHO the Harris tune is kind of stunted melodically; Adam took it quite a bit further. That said, speaking objectively once again, Kings of the Wild Frontier is a much stronger record and holds up a lot better. By the way, the newer track I played for you a while back is the best thing on that album… keep that in mind. It doesn’t get any better, sadly. * = the other two were, of course, A Flock of Seagulls, and something by Deniece Williams or someone of her ilk. Prince Charming did let the side down after Kings Of The Wild Frontier and backwards discovery of the darker, Post Glam New Wave of Dirk Wears White Sock. Where KOTWF swam deep in a sea of backed up hype and New Wave Rock Star Bravado, Prince Charming seemed to take itself a bit to seriously. Stand And Deliver is absolutely the height of Ant Music, but I also have as soft spot for Ant Rap. It’s just a song that doesn’t take itself seriously and I think it’s a mistake to think it does. It’s Glam Rap. Prince Charming traded in much of the “tribal” percussive interest of KOTWF for latin rhythms which were VERY popular among the New Romantics. The title single did offer one saving grace in the b-side Christian D’Or – one of my favorite Ants songs. It’s like a blueprint for that cyber-rockabilly that SS Sputnik would unleash 5 or so years later. And I know I am in a very small minority, but I REALLY liked Adam’s 2013 album. The track Vince Taylor made my Top 40 of that year. I just find it an entertaining album. Echorich – Funny you should mention a B-side. I bought “B-Side Babies” as soon as it came out, and have loved it ever since. Between it and the DLX “Antmusic” I found “Prince Charming” to be utterly superfluous. I might have to buy a DL of “Scorpios,” though! It worked like a fiend for me. I am having trouble thinking of any further examples of this in the Nu-Ro canon. Classix Nouveau, DD, Japan, Ultravox, Visage… where are these Latin rhythms you speak of? JT – Of course, you would be synth-centric when reflecting on New-Ro. Echorich is thinking about the Latin Funk vector that sprang from the New-Ro movement by the Summer of ’81. Spandau Ballet got the ball rolling with the B-side to “Musclebound” and owned it for “Diamond.” Their pals Blue Rondo Ala Turk [Christos Tolera] were also major players. “Scorpios” fits super-nicely into that scene! Yup, that is EXACTLY where I was going. I’m afraid once New-Ro took flight outside of London/The Blitz Scene and Birmingham/RumRunners, it stopped being a scene for me. The music papers did a good job of spreading out the scene as well lumping in a lot of groups who really had no affiliation with it. I will give the Ants and Bow Wow Wow credit for thoroughly mixing music and fashion with their individual experiences with McLaren and Vivienne Westwood. It will always be a bone of contention as to whether Ant inspired Westwood or Westwood created the Ant Look, but Westwood certainly made bank with her Pirate & Native American inspired collections. You could tell McLaren had more sway on Bow Wow Wow as their Pirate/Warrior looks also included leather jackets and biker looks. But true New-Ro’s made their own togs or cobbled together styles to create the new. Wearing something twice was really never even a possibility as you would likely have to deconstruct a past frock to create the new one. London and Paris fashion houses would certainly take note through the 80’s to those music/fashion iconoclasts.